With seating for up to five and a 2.5-liter engine that utilizes a Continuously Variable Valve Timing Control System for a horsepower rating of 170, the 2019 Nissan Rogue is the sleek, intuitively designed SUV you've been waiting for. Here at Premier Nissan of Metairie, we have competitively priced Rogue models in stock, so don't hesitate to contact us about this lineup today. We'll accompany you on a thrilling test drive so you can experience the Xtronic CVT transmission for yourself and can tell you all about the Intelligent All-Wheel Drive system that can be added onto your Rogue. Meet the 2019 Rogue SUV today, drop by Premier Nissan of Metairie near New Orleans, Louisiana! Equip your 2019 Nissan Rogue with the latest technological advancements, opt for Nissan Intelligent Mobility™! The Automatic Emergency Braking feature is available with Pedestrian Detection and thanks to the Intelligent Cruise Control system, drivers can take on a long haul with ease. Visit our Metairie, LA Nissan dealership to hear all about Intelligent Lane Intervention and ask to see the Intelligent Around View Monitor that displays a 360-degree bird's eye view of your Rogue in action. From its Nissan Advanced Air Bag System to its Lower Anchors and Tethers for Children (LATCH) and zone body construction, the 2019 Rogue is a new car for sale that offers the peace of mind you crave. Get in touch with our Nissan sales department to hear all about Vehicle Dynamic Control and feel free to let us know about the Rogue trim model that has caught your eye. We'll go over the safety systems that come standard. 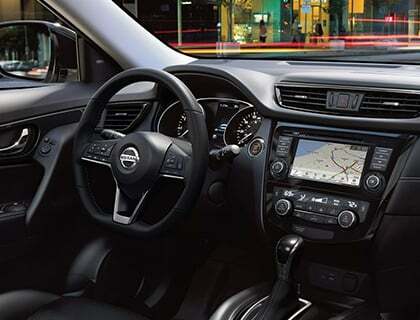 Slip into the cabin of the 2018 Nissan Rogue here at Premier Nissan of Metairie to get a feel for the comfort the zero gravity seats can provide and turn on the Dual Zone Automatic Temperature Control to stay at your ideal temperature during your cruise. This 2019 Nissan for sale is able to provide for the comfort of your passengers as well, as it also offers rear A/C vents and a Remote Engine Start System with Intelligent Climate Control. Take advantage of the Rogue's Motion Activated Liftgate to open up the trunk when your hands are full and be sure to ask the Nissan associate assisting you about the Divide-N-Hide® cargo system and how it can help you keep valuable items out of sight. We offer professional Nissan loan services that make it easy to finance the SUV trim model that you deserve. Our credit application is available online, so don't hesitate to complete one now! From our Powertrain Warranty for Life offer to the work we do with Giving Hope, there are many reasons why drivers choose our new and used dealership in Metairie when auto shopping. If you're ready to secure a dynamic vehicle that blends style with sophistication and power with comfort, visit Premier Nissan of Metairie to meet the impressive 2019 Nissan Rogue lineup!